i love traditional quiche, but sometimes it's nice to lighten it up and make it crust-less, which saves both time and calories. recently we needed to throw together a quick yet hardy breakfast. 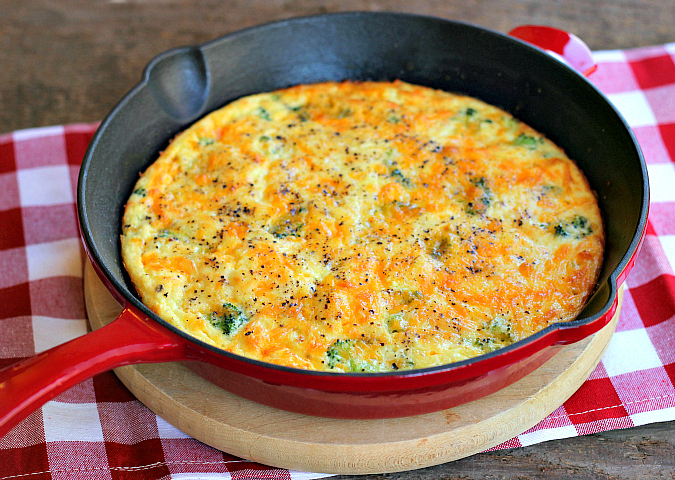 we beat some eggs and threw them in a cast iron skillet along with broccoli and cheddar for a delicious crust-less quiche. the eggs are whipped with mayo and milk which makes them light and fluffy. as the eggs bake in the cast iron skillet, they form a great "crust." this recipe is perfect for a quick yet satisfying breakfast on the go. it's a great base recipe because you can add anything to your quiche. we added broccoli and cheddar, but you could add any veggies or meat too. preheat your oven to 375 degrees F. place the butter in a cast iron skillet and put the skillet in the oven while it preheats to melt the butter. meanwhile, whip together the eggs, mayo, and milk. remove the skillet from the oven and swirl the butter evenly around the bottom and the sides of the skillet. place the cooked broccoli in the bottom of the skillet. pour the egg mixture over the broccoli and top with cheddar cheese and ground black pepper to taste. bake for 20-25 minutes, or until the eggs are set. serve warm. That looks delicious. I love breakfast casseroles, especially quiches. I will definitely make that. Nice picture too. Oh my goodness, these are my favorite! 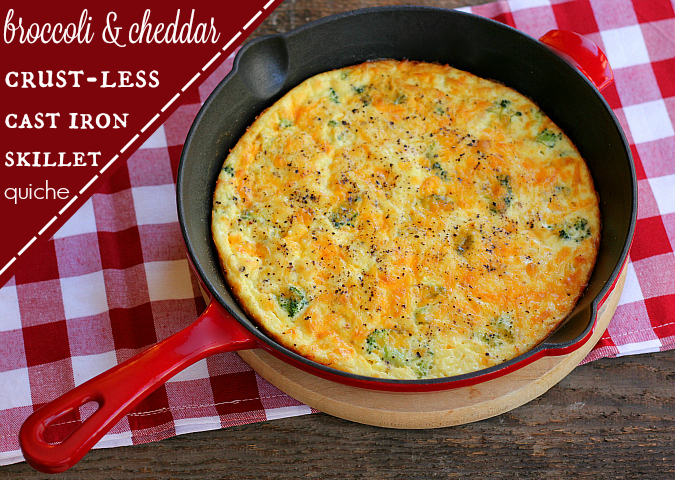 Crustless quiche is on our menu at least once a month, if not more. I usually add in some kind of meat and a TON of vegetables - my kids end up eating all sorts of things they would normally turn down. :) I've never heard of mixing in mayonnaise though - I'm going to have to give that a try next time.